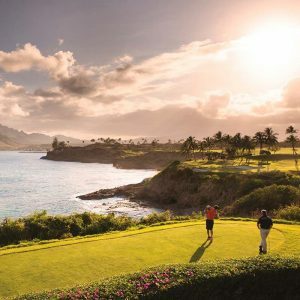 On Kauai you will find some of the most spectacular resort and public golf courses anywhere. 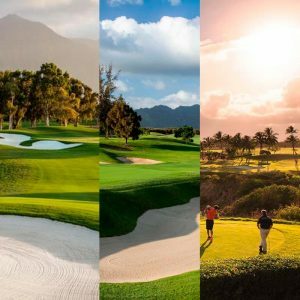 Designed by some of the most prominent golf course architects of the last 50 years – Jack Nicklaus, Robin Nelson, Robert Trent Jones Jr. – our courses take full advantage of all that Kauai has to offer. 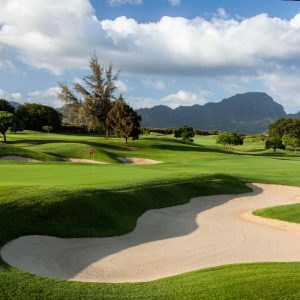 Whether you are looking for majestic mountains, rugged ocean cliff sides, mountain streams and waterfalls, deep ravines, or dense tropical jungle, all can be experienced in a single round of golf at one of Kauai’s fine courses. The Ocean Course at Hokuala features the longest stretch of oceanfront golf holes in Hawaii. Recently renovated under the direction of golf course architect Jack Nicklaus, the newly renamed Kiele Moana Nine features brand new TifEagle putting greens and renovated bunkers. 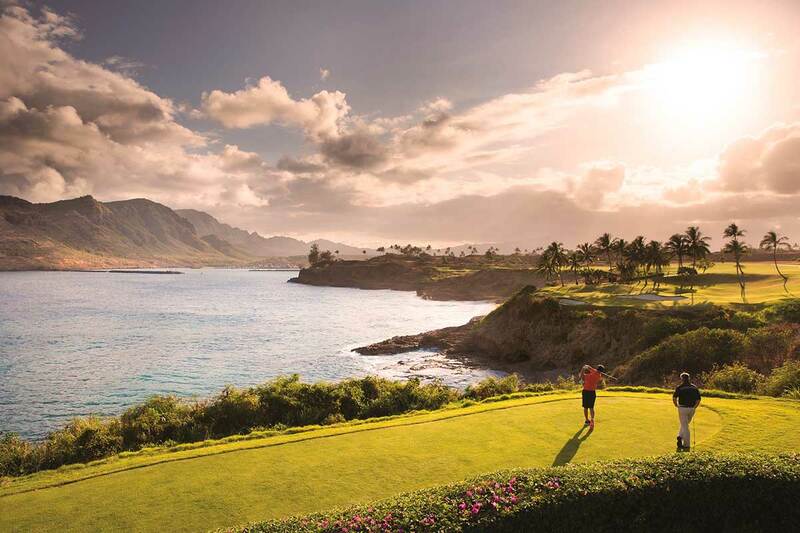 All in all, a full half mile of unparalleled ocean front golfing for you to enjoy during your stay in Kauai. 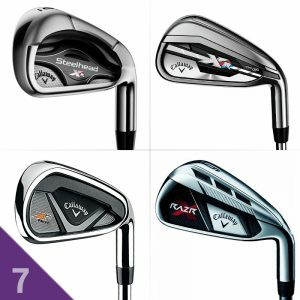 Tiger Woods, Phil Mickelson, Ernie Els, Jim Furyk… These are just a few of golf’s greats that have competed in the PGA Grand Slam of Golf, hosted by Poipu Bay Golf Course between 1994 and 2006. Recently completed greens and bunker renovations ensure top notch conditions as this course winds between Poipu Bay and the Ha’upu Mountain Range. Fresh off of a complete renovation by architect Robert Trent Jones Jr., the Makai course challenges golfers to negotiate a spectacular combination of lakes, woodlands and ocean front bluffs. Excellent course conditions abound thanks to the introduction of Seashore Paspalum to all tees, fairways and greens. Upon opening as a 10 hole golf course in 1997, this local favorite was hailed as one of the Top 10 nine hole golf courses in America by Sports Illustrated Magazine. Laid out by Robin Nelson, Hawaii’s most prolific golf course designer, Puakea was expanded to 18 holes and takes full advantage of the majestic backdrop and terrain of the Ha’upu Mountain Range of Jurassic Park fame. The first course located on the sunny south shore resort area of Poipu, Kiahuna boasts some of the fastest greens on Kauai thanks to a thorough renovation that featured a transition to Seashore Paspalum Greens. Architect Robert Trent Jones Jr. has crafted a design that weaves among the remains of an ancient Hawaiian village. Perched on a hillside in Kalaheo, this nine hole golf course offers sweeping views of Kauai’s south and west shore lines. A true local secret, it was donated to the people of Kauai in the early 1900’s by sugar plantation owner Walter McBryde. For more information on rates, please contact the golf course at (808) 332-9151. Kukuiolono Golf Course does not take tee times.